Tophatter is the world’s fastest-growing and most entertaining marketplace with live online auctions every day in a wide variety of categories. Tophatter is funded by leading Silicon Valley venture capital firms, including Goodwater Capital, August Capital, and CRV. Leveraging smart technology to serve shoppers a unique experience through every visit, Tophatter delivers the world’s most efficient rapid marketplace and connects sellers to over 10 million shoppers across the globe. Shoppers compete in fleeting, 90-second auctions to win deals of up to 80% off jewelry, electronics, beauty, and fashion. 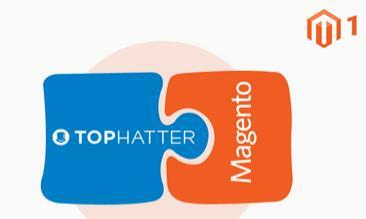 Tophatter Integration for Magento is an amazing API integration solution that helps the Magento 1 store owner to synchronize inventory, price, and other product details for the product creation and its management between the Magento store and the Tophatter marketplace. The Tophatter Integration for Magento extension interacts with the Tophatter Marketplace to integrate the synchronized product listing between the Magento and the Tophatter retailers. After installing the extension, the merchant can create the Tophatter Categories and the dependent attributes on the Magento store. The process enables the merchant to configure the desired product category into Magento for automatic submission of the selected product to the same Category on Tophatter. Profile-based product Upload: Admin can create a profile and map the Tophatter category and attributes to the Magento 1 category and attributes, and then after assigning the products to the profile can easily upload products to the Tophatter Web site. Synchronized Product Editing: Besides adding the products, any product information changes made on the Magento store reflects on the Tophatter. Synchronized Inventory and Profile Based Pricing: Inventory Synchronization at regular intervals. product Listing is established between Magento and Tophatter. Profile-based price increase or decrease. Creation of Magento Orders: The newly placed orders on the Tophatter Web site are automatically created in the Magento store with all the required details as it is on the Tophatter Web site. Consolidate Orders: Easily manipulate orders from the Magento store. Product Category Mapping: Follows many-to-one category mapping philosophy. Admin can map many categories of the Magento store to the single category of Tophatter. Updates Information: Changes made in the Magento store reflects on the Tophatter Web site. Bulk Upload System: The merchant has the flexibility to upload any number of products on the Tophatter Web site using bulk product upload feature.